In the afternoon of the 9th February 2007 I went to St Mary the Virgin COFE Church in Banham, Norfolk, England to go lay down some flowers at the grave site of a good friend that had died a couple of years ago of an unfortunate circumstance. Whilst visiting the grave site my Mum and I decided to go into the Church to see the interior and take some photos. I took several photos of the church from the inside; two of the window panes, one at an angle of the pews and last but not least one from the alter directing towards the church organ. At the time of taking the photos from the alter facing the organ I was telling my Mum about my friends funeral and what had taken place that day. 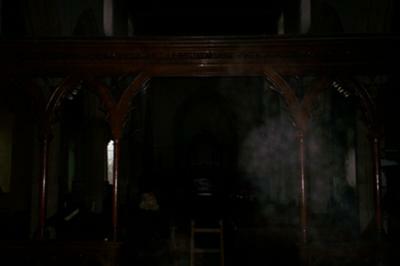 After spending several minutes in the Church Whilst taking all of the photos nothing unusual appeared through the lens. Then after leaving the church we headed down to one of the local pubs to have a drink and some lunch. Minutes after getting into the pub and having a drink I decided to go through all the pictures I had taken. Much to my surprise I came across the most unusual appearance in one photo that took me a moment to acknowledge. A mist like appearance appeared to the right of the photo right at the time I took this photo I remember telling my Mum where the coffin had been placed throughout the funeral. I thought straight away could this be a connection to him! After taking the pictures I tried to put two and two together to work out what the mist like appearance could be. On that day in question it was not cold (you couldn't see your breath), also no one was smoking obviously as we were in a Church. No one was consuming a hot tea of any kind and none of the other pictures had the same mist like appearance ruling out that the camera could be at fault. So going back to my original conclusion I do believe that whilst talking of my friend he decided to appear to show his presence in the usage of the mist??????. That is definitely not a finger print. Awesome picture. Congrats. Hi, I have had others ask the same question but it's not a finger print as I took several shots after and no 'finger print' appeared. You also have to remember that whilst I took these photos I didn't even see the unusual appearance through the camera and was just taking random pics of the inside of the church. I may see if I am able to upload the additional photos I took inside the church.